In case you didn’t hear it this week, the Guitar Hero franchise is no longer. In tribute to their fallen gaming comrades, the guys over at Capcom decided to pay tribute to the game with a little game of their own – Marvel vs. Capcom 3 played on a couple of Guitar Hero guitar controllers. 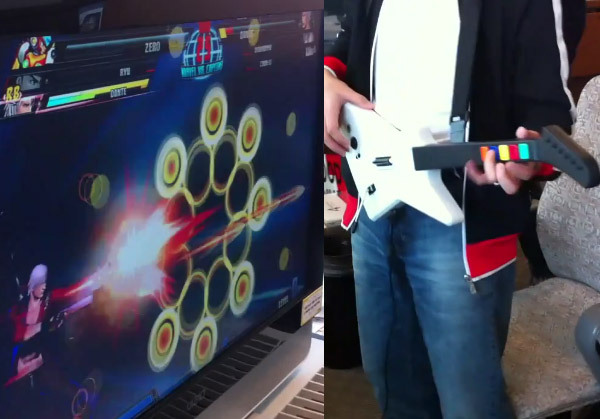 From the looks of the video clip below, it’s not the most practical way to play a combo-based fighter, and they have to play in “Simple” mode just to have any chance of playing, but for some reason, it never dawned on me that you could play other non-music games with your music peripherals. I don’t know why, but I just never thought about it. It just makes me want to see if I can get through the entirety of Ninja Gaiden II on hard mode using only my Rock Band drum kit and a couple of drum sticks.